Over 25,000 square feet of climbing surface is available at each location. With walls up to heights of 50′ and routes up to 70′ long, our gyms cater to competitive and recreational climbers alike. 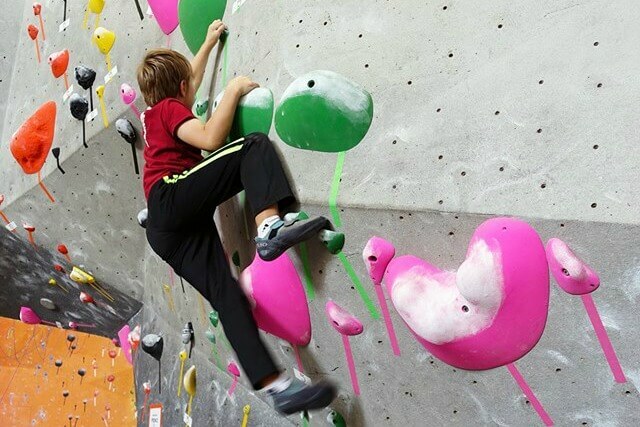 Each gym also features unique climbing features such as the full-training areas and giant bouldering mushroom in Ann Arbor, and the 15 meter official competition speed climbing wall and ice climbing training area in Madison Heights. Both beginner and experienced lead climbers will find routes that are both technical and fun. Our dedicated lead climbing walls have extensive lines and challenging features, while our bouldering areas offer interesting topography and an innovative mat system for softer landings. Along with hosting USA climbing competitions seasonally for youth competitors, Planet Rock boasts local-in house competitions that are open to all skill levels and varieties of climbers.